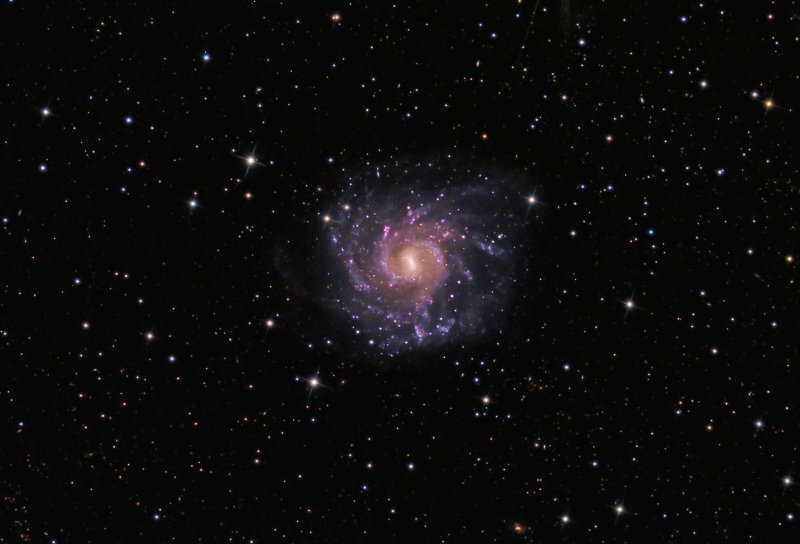 Lying in the constellation of Grus 40 million light years away, NCG 7424 is a rather faint, face-on spiral galaxy thought to be similar in appearance to the Milky way. Within the arms there are several bright star clusters comprising massive young stars. This is a 16.25 hour LRGB exposure (600, 135, 120, 120 minutes) comprising 10 and 15 minute subexposures. Average seeing was 2.9 arcsec (Poor). Consequently the scale of the image has been reduced by 30% to mask some of the poor seeing artefacts. FOV is 33.4 x 23.0 arcmins @ 0.84 arcsec/pixel (70% full scale).